Remember Gauntlet? No, not the forgettable last one, or those ones you played in the late 90’s. I’m talking about the Gauntlet you played in the arcade and poured quarters into because it incessantly told you that ‘Wizard needs food badly’. 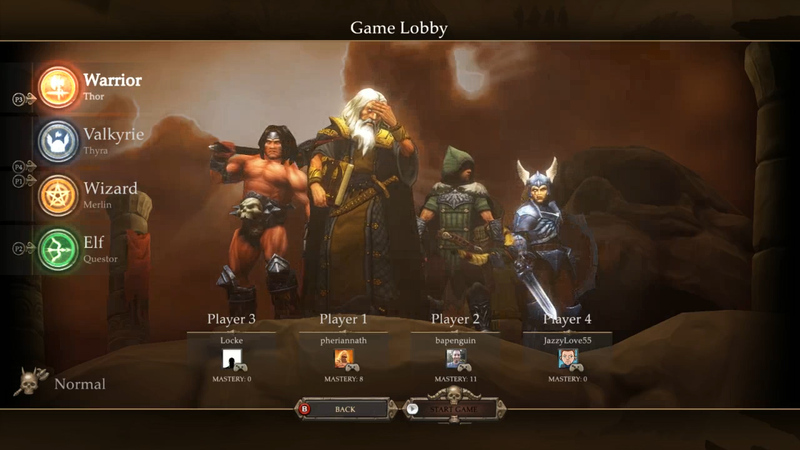 The 2014 Gauntlet is a remake of the 1980’s classic, blending the old school gameplay with some new school ideas. 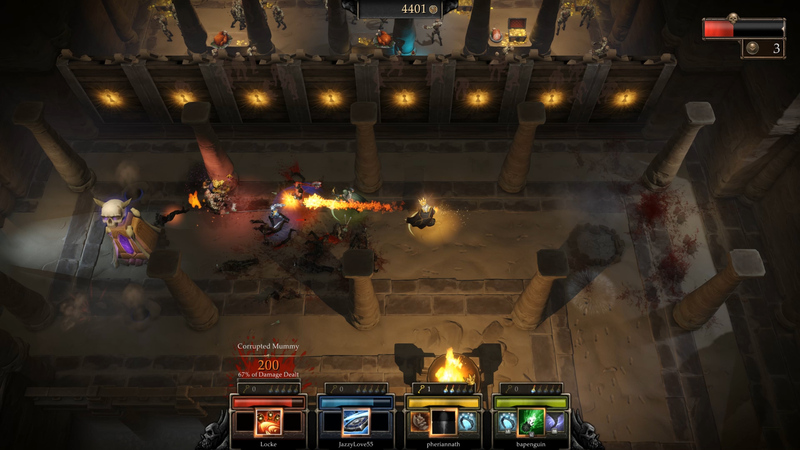 At its core Gauntlet is a simple dungeon crawler. Arguably the first hack and slash game where a group of players adventure through levels collecting gold, keys, food, and potions. Of course the enemies in each cave, cavern, and castle are going to make the journey much more difficult. 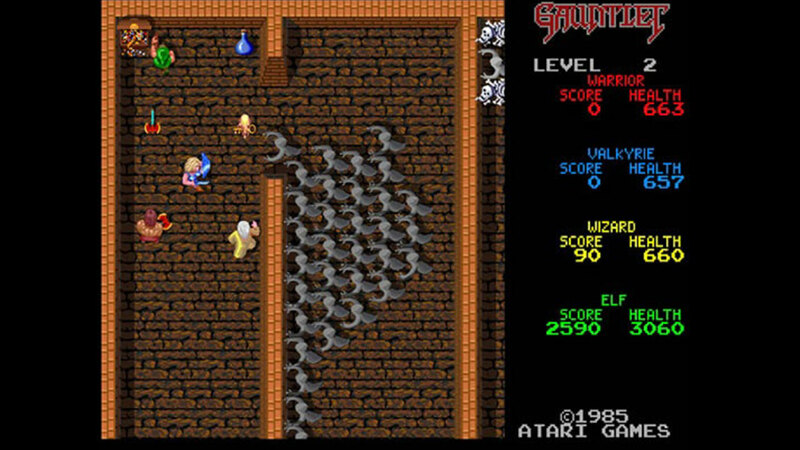 It is all about cooperation in Gauntlet as you are going to need a good group with sharp wits to take down the seemingly endless hordes of monsters separating you from the end of the level. 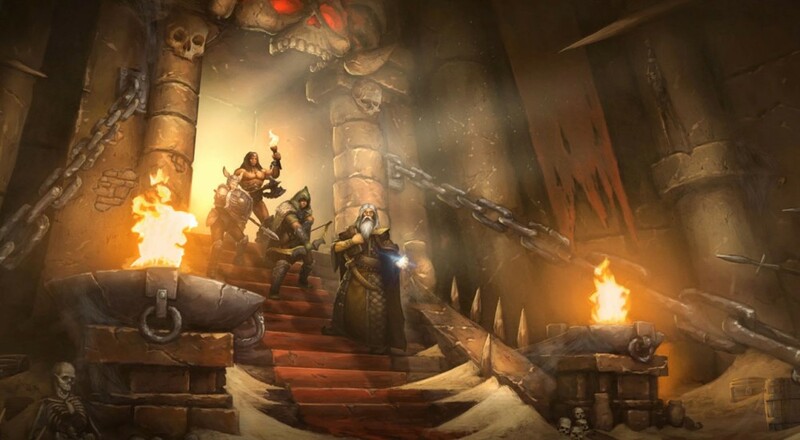 Players can join with up to 4 friends locally or online to conquer the dungeons of Gauntlet. I’ll say this now, play Gauntlet with a group and never alone. The most drastic difference between the classic arcade and the new rendition of Gauntlet are the characters. The original cast returns with the Warrior, Wizard, Valkyrie, and the Elf but this time each character has evolved past pushing a button for a simple ranged attack. The characters come with their own skills and movesets which make their playstyle different. The new range of skills for each character compliment each other quite well and make cooperation crucial for success. Thor the Warrior is the melee brute and the simplest of the heroes. He smashes things, and does so with efficiency. He can charge into a group of enemies, smash down his axe and finish large groups off with a spin attack. He lacks mobility but makes it up with sheer brute strength. He sounds typical but is far from easy as a mistimed attack and cause a crowd of enemies to surround you. Thyra the Valkyrie is the other melee class and has quite a diverse skill set. Her spear charge cuts through a line of enemies quickly and her shield throw makes Captain America blush. Most importantly her shield block will protect her from incoming attacks and will send enemies flying backward. Questor the Elf is straight out of a twin stick shooter with a fast bow and a bottomless quiver. He has a dodge roll for sticky situations and his bombs do massive damage to anything within the blast radius. His charge attack is a sniper shot that will do a large amount of damage to the enemy unlucky enough to block the arrow with its face. Finally Merlin the Wizard is by far the most complicated hero with a total of nine spells to use. He uses a spell combination system that is similar to the one from the game Magicka, he can combine two of three elements: fire, lightning, and ice. Each button combination results in a different spell to use, each with their separate cooldown. Not recommended for beginners, but once you get the hang of Merlin he is a blast to play. 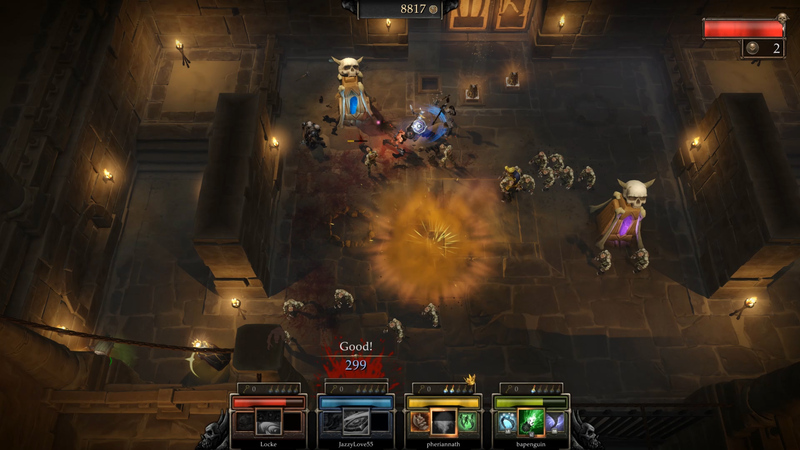 The levels in Gauntlet are broken down into chapters, with each chapter having a series of floors players must navigate through. Levels consist of a series of rooms complete with monsters, switches, and of course the sweet sweet treasure we all covet. To change things up, each floor in a chapter brings with it a different challenge. It begins with the basic start to finish style with a another floor being a horde mode challenge type level in one big arena room. Some of the most demanding floors feature Death, a large ominous grim reaper that chases you throughout the level complete with one hit kills. Don’t worry, he can go through walls as well. Of course there are some righteous boss fights to put a nice end to a chapter. The changing style between each floor keeps things fresh and takes the edge off some of the repetition inherently packed with Gauntlet. Finishing a chapter brings on a whole new experience unique to this Gauntlet. The co-opetitive score screen still happens, detailing who scored the most gold, kills, and bonuses. But don’t worry, you’re also ranked as a team overall against other groups of similar adventurers. Following this players get another series of achievements. These achievements track a variety of actions from killing enemies with a specific skill to how many times food is shot instead of consumed. Completing these tasks a specific number of times will award the character with a perk relating to said task. For example, killing 2000 enemies with the Warrior’s spin attack will get you a reduction in the cooldown time. Keep in mind each of these perks are specific to the character so there is always something to work towards on each of the heroes. It’s a small addition but adds both replay value to Gauntlet and some incentive to try each of the classes and build towards making them more powerful.